McLintock! (1963) is my favorite John Wayne movie. Not being a big fan of Westerns in general, this hardly may be great praise, but perhaps it is. It is on my short list of “westerns worth watching.” I love the humor, the banter, and the playfulness of this movie. My grandmother loved Westerns, and she loved John Wayne. She would have been ninety years old this past July, and that is a big part of why I volunteered to do this piece. John Wayne made a career out of being the cowboy, the “man’s man” on the silver screen–and why not? He was huge. He’s impressive on screen and was fairly impressive in person. (There is a statue of him in Madame Tussaud’s in London–or at least there was several years ago–and you can see for yourself.) He was also known not to be shy about his opinions, which pretty much reflects his on-screen characters. McLintock! was indeed a comedy, but also an expression of his own conservative views. McLintock’s justice–afterwards, we see the mud brawl. He was responsible for naming the Governor (Robert Lowery) Cuthbert H. Humphrey after his own political thorn, Senator Humphrey. The anti-feminism within the plot feels forgivable, probably due to the film’s unabashed childishness–spankings, fighting in mud, resisting decorum. More than anything, we watch John Wayne act like a very large, intoxicated child. His escapades are so well-known that the local children race to catch his hat in the morning (which he has thrown to the weather vane atop the roof in his drunken return home). To make matters more interesting, Maureen O’Hara plays opposite him as his estranged wife Katherine, all the while informing him he should act like a grown man, instead of an ape. If anyone could play this role, it was Maureen O’Hara. Even Maureen O’Hara’s in the mud. In McLintock!, Wayne reunites with O’Hara once more (in the fourth of their five films together), with appearances by Patrick Wayne, Stefanie Powers, Chill Wills (Best. Name. Ever. ), and a goofball performance by Jerry Van Dyke. The only really sentimental part goes to character actor Jack Kruschen as Mr. Birnbaum. They made a good choice in casting him; he made short roles go far in film and television throughout his career (it appears broadcast television had to reconfigure itself to do without him after his retirement in the late nineties, as he was in countless major series for more than forty years). What I love about this film is that it’s quotable, such as during the famous mud scene when the Chief declares, “Great party, but no whiskey. We go home.” He’s a great character, rather Sondheim in nature, with his random appearances regarding whiskey. Then it flips and they are crucial to the development of the plot, or subplot, depending on which plot you consider primary. Regardless, he’s an excellent addition to the film and helps set the unique tone for this Western piece. My favorite piece of John Wayne timing is the fight with Maureen O’Hara. After said fight, in which she refuses to have a discussion with “an intoxicated man” and storms up the stairs, he follows her, stating, “And I am not intoxicated. Yet.” This scene sums up the film and their relationship in a few lines of spot-on timing. Mrs. McLintock vs. Mrs. Warren–I do love Mrs. Warren. This film is fun and lighthearted. It’s the type of film that makes you think they had fun making it, or at least hope they did. As I enjoy assigning accompanying foods to movie-watching, I particularly recommend partnering McLintock! with biscuits, in deference to Mrs. Warren’s cooking prowess, and perhaps a fried chicken dinner with mashed potatoes. 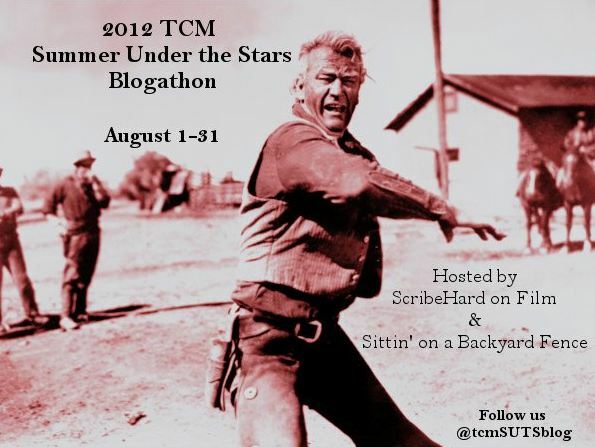 This post is an entry in the “2012 TCM Summer Under the Stars” Blogathon sponsored by Jill of Sittin’ on a Backyard Fence and Michael of ScribeHard on Film. Make sure to check in with Jill and Michael throughout the month for more entries from around the blogosphere! McLintock! airs at 5:45PM EST today on TCM. I should perhaps give this film another chance. I saw part of this back before I became a fan of Wayne’s, and I found it a little too forced for my taste. Now that I’ve grown to appreciate Wayne as an actor, as well as a comic actor, I will try it again thanks to your write-up. In regards to your comments concerning the actors I’d like to make two additions. First up is Yvonne De Carlo (who never looked prettier), managing to serve up some nice dialogue on her own. Then there’s Michael Pate as Puma: a watchable addition to the Wayne archetype of Indians who have fought with Wayme, but who also share a mutual respect. As for favorite scenes, I always liked the one which took place when Wayne and O’Hara are in the back room of the grocery store, and Jack Kruschen is reminiscing about the time O’Hara’s character first shows up with a new baby. Now Wayne’s character and O’Hara’s are supposedly on the outs . . . but as Kruschen brings back old memories the audience can clearly see the mutual yearning rising on their faces. For all his tough-guy persona I don’t think John Wayne received enough credit for the romantic scenes which cropped up in his films, and this is an excellent example. I agree completely! Thanks for the input. I particularly liked Michael Pate’s performance, especially the way he helps drive the plot and John Wayne’s character development. Thanks for the comments! Thanks for this contribution to the blogathon! I have to admit that I’ve seen very few John Wayne films, but after everyone’s posts today I’ve added several to my must-watch list, this film included. I’m the editor/designer of Maureen O’Hara’s official website as well as her archivist for the past 17 years. 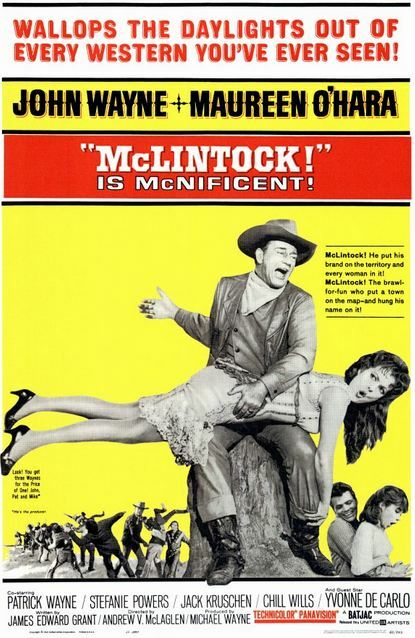 “McLintock” still remains the most popular of Maureen’s films…even surpassing “The Quiet Man.” Fans of several generations still love it. Check out “Maureen O’Hara Magazine” on Google or if you’re on Facebook I have an extension page there – same name “Maureen O’Hara Magazine – Official Site” which is more current. The initial site carries essays, photos, family pics, etc. accrued over a couple of decades and with Maureen’s endorsement. I like the Facebook a lot now because I can interact with the fans more. I love Wayne & O’Hara together in any movie – they are so much fun to watch. Wayne hasn’t always been given enough credit for his acting ability, especially for his romantic scenes and his comic timing. I really liked this post. Sometimes people like to slag Wayne, but there’s a reason he was – and still is – a superstar.